The #1 sand filter in the world. Triton II is the result of over 40 years of product evolution and refinement. It has set the industry standard for effectiveness, efficiency, long runs between service and providing years of dependable, low maintenance operation. 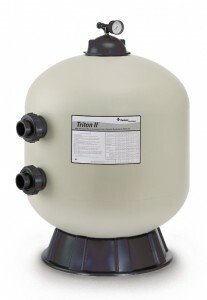 Triton II features a special internal design that keeps the sand bed level ensuring even water flow, and resulting in the most efficient filtration possible.